It’s hot y’all. Time to get crafty INSIDE am I right? Here’s a fun handprint craft that’s easy to make and you probably won’t even have to buy anything! Originally posted January 2012. Oscar has been hit or miss with the crafts lately. For some reason he never wants to do a project when I ask him, yet he ALWAYS wants to do one right before bed. Of course he does. He knows how much I love doing crafts with him and tries to pull that heartstring to eek out a few extra minutes of awake time. I don’t usually fall for it, but I always say tomorrow we will do a project! Sadly, by the time tomorrow comes, he has lost interest. So this morning when he asked to make another reindeer I was stoked! We did a simple handprint reindeer sometime during Christmas where we traced his hands for the antlers and there was lots and lots of gluing. He loves glue so we always have to incorporate it. I didn’t really want to make another reindeer though so I started thinking of what else we could do with his hands. He’s been on a major Madagascar kick so the answer came quickly, a lion! Cut a circle out of one piece of brown paper and fold the remaining 3 sheets in half. Trace your child’s hand on the page and cut out six hands. I did this all at once but you could break it up if it’s too thick. 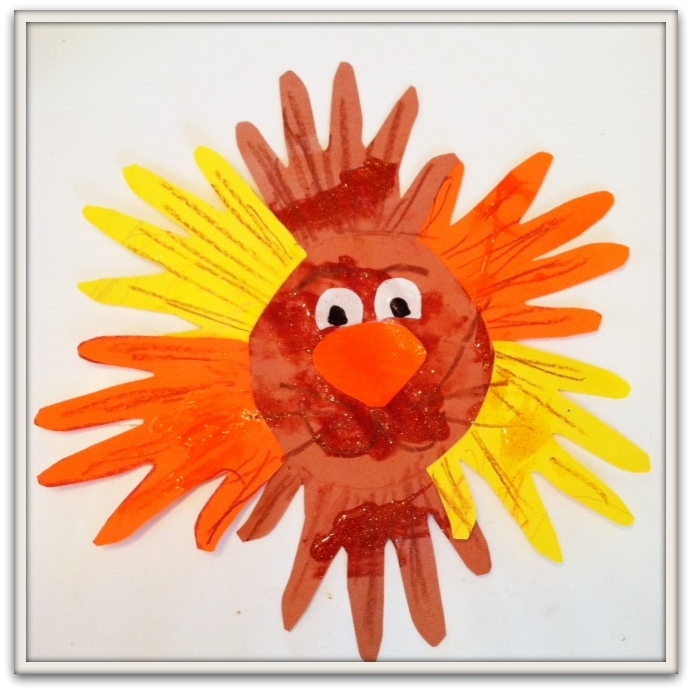 Have your child put glue around the outside edge of the circle and glue the hands on one by one. Then flip it over! Cut out two eyes from your white scrap paper and color circles on them with your black crayon. Glue those bad boys to the circle and your lion will be (according to Oscar) Lookin goooooood. Cut out an orange triangle for the nose and draw on the mouth and whiskers with the brown crayon. I thought the lion’s mane would look better with some detail so I added the brown lines while Oscar painted his face with glitter glue. And then we gave our lion a name. Want more crafts? Check out these easy paper pumpkin crafts for kids. What a cute idea. 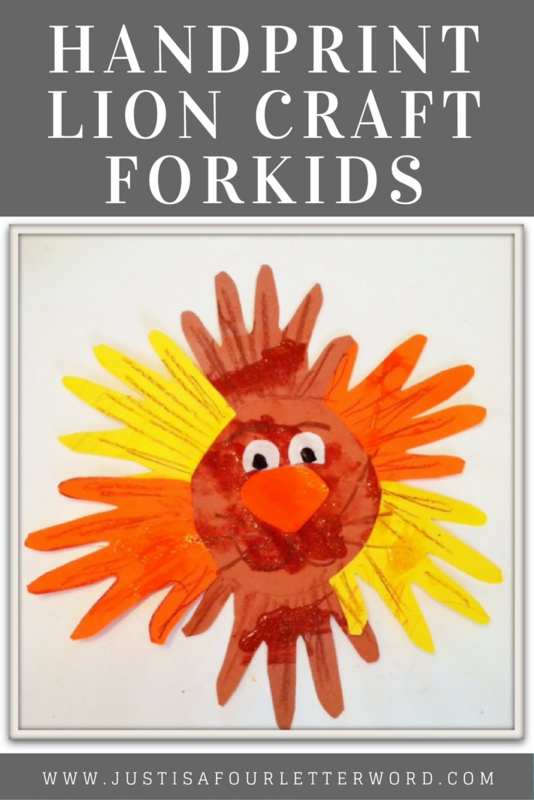 My kids love crafts & were always looking for new ideas. I love it! 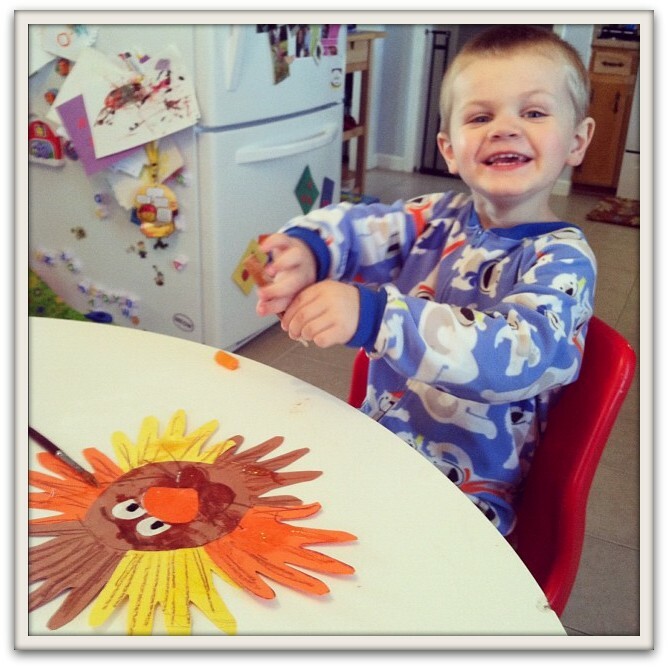 Handprint crafts are the best!